Paul’s experience, as he works for Hope Trust, has him looking for ways to put into practice what he himself is learning as he grows older! Understanding that the work of the charity is all about people, meeting them where they are and helping them move closer to where they want to be, allows him to put his life experience to good use initiating, developing and enhancing both relationships and activities to benefit those the charity comes into contact with. Sheila’s work for the charity has meant that there are even more chances to chat over good food! Tasked with identifying and developing the charity’s activities, Sheila is always looking for new ideas, new partners that Hope Trust can work with, or the opportunity to reinvent an ‘old’ idea and give it a new lease of life. All activities hosted by Hope Trust seek to offer people a safe, informal, welcoming place to meet when connecting with others who are going through a similar life journey, free of charge. 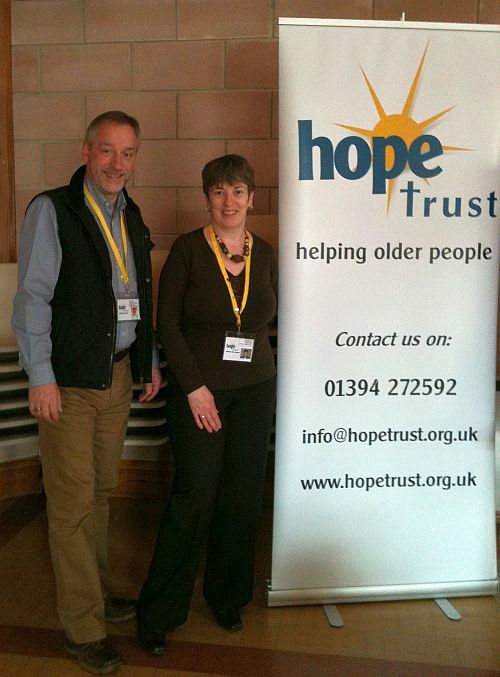 In delivering the work of Hope Trust, Paul & Sheila are assisted by a team of brilliant volunteers. Together they ensure that the charity reaches as many people as possible. Our Trustees team along with the Minute Secretary, ensure the charity is both professional and responsible in all that it does, overseeing compliance with all legislative requirements and ensuring best practice. Visit the ‘How you can help’ page if you’d like more information on the many and varied volunteer roles available within the charity.